The apple doesn’t fall far from the tree it seems as Cristiano Ronaldo’s son, Mateo, has already been showing off his ability with a football. 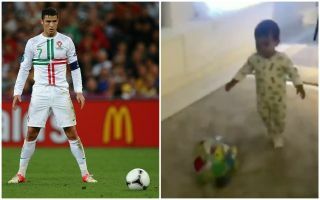 Despite not yet even turning two years of age, the youngster’s coordination and strength is clearly on point as seen in the video below filmed by Georgina Rodriguez. Ronaldo’s better half can be heard loving how the little one is running around showing off his decent right foot as it appears as though he has already picked up a couple of tricks from his old man. Time will tell whether or not he develops to be good enough to follow in his father’s footsteps, but with Cristiano Ronaldo Jr also impressing to date with the clips being shared on social media, it appears as though the Ronaldo name could live on after the Juventus superstar hangs up his boots. Ronaldo’s 1.5 yrs old younger son Mateo kicking the ball for the very first time while mom Georgina filming it.? ?